PARKING FOR ALL PRLL FAMILIES IS AT THE VERIZON WIRELESS PARKING LOT (SEE BELOW). This has not changed as a result of the new construction. The road area at Anderson Field looks wider and more open, but we are still subject to parking limitations under the terms of our Lease with the American Legion, although we do now have more handicapped and senior parking. 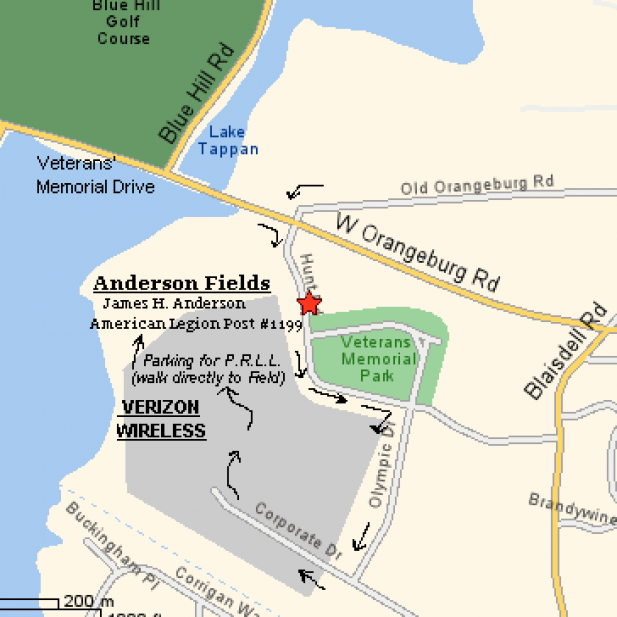 The area when you first come in (closest to Brady field) is for American Legion parking and off limits to all of PRLL. We will try have signs posted. The area closest to the Hopper has been cordoned off with some temporary fencing and is now the designated handicapped parking area. There are multiple blue parking signs showing this area for those with the handicapped placards and plates only. (Note: these signs were removed during the construction/renovation last year and we will attempt to replace them). Beyond this newly designated “handicapped zone”, limited parking is available for the elderly, our umpires and specified volunteers. PEARL RIVER LITTLE LEAGUE FAMILIES MUST USE THEIR PASSES AFFIXED TO THEIR REAR VIEW MIRROR. PLEASE PARK ONLY WITHIN THE LINED SPACES, AND NOT ALONG THE CURBING NEXT TO THE FIELD. WE MUST HONOR VERIZON WIRELESS' RULES TO PRESERVE OUR PARKING PRIVILEGES. WE DO NOT PAY FOR THIS PARKING -- IT IS EXTENDED TO US BY VIRTUE OF VERIZON WIRELESS’S GENEROSITY. Please do not park in the Handicap spots, reserved spots and/or along the curbs in Verizon Wireless, or in the first two rows closest to the Verizon Wireless building. PLEASE OBSERVE ALL TRAFFIC RULES AND RESPECT THE SECURITY STAFF AT VERIZON WIRELESS. PLEASE DO NOT ARRIVE UNTIL BEFORE 1 HOUR OF GAME TIME. YOU WILL NOT HAVE ACCESS TO THE LOT.